By continuously harvesting-rainwater, you can take advantage of a rain-barrel, avoid water-restrictions, and make use of a free natural renewable resource without much effort at all. Unlike household water, which among other efforts requires an extensive collection process and chemicals for purification purposes, natural rainwater just comes to us. With water-restrictions in our neighbourhoods the way they are, it's difficult to keep up. Restrictions aren't just limited to watering lawns. In reality, we aren't to be washing vehicles or even watering vegetable gardens or flowers on the off-days or beyond regularly scheduled watering hours. Depending upon the extent of the hot weather, this is extremely frustrating, especially when you consider the costs invested in planters and pots to beautify your property. And what about the thirsty vegetable garden? Personally, there just doesn't seem to be enough allowed watering time for the lawn come mid-summer. We have resigned ourselves to the fact that as of mid July, the lawn is beyond coming back to a lovely green. It's just brown and sick-looking, and there's not much we can do about it. Because we had such a terrible summer here last year because of so much rain, it was the nicest my lawn has ever been in years. Pretty ironic! But, when we are lucky enough depending upon where we live to get a decent rainfall, we should be harvesting-rainwater collected by some means for use around our yards as much as possible. The best way to collect water is by using a plastic or wooden rain-barrel. If you can set a barrel just underneath the downspout you could have free water to water flowers and give your vegetables and houseplants a drink too. 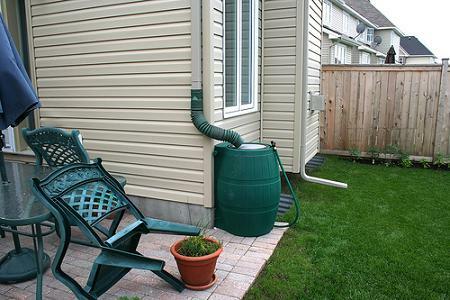 You could even put a rain-barrel at the corner of a shed or garage as well if they have downspouts. Check with your local Utilities Office to see if they supply plastic barrels. They just might supply them free of charge, or at a reduced rate. At the very least, they should be able to advise you where to get them. They can usually be purchased for a minimum of 50 - 60 dollars. Make sure you have a lid of some kind for your barrel. This lid prevents dirt and debris from getting in. It should also keep mosquitoes out as well. We have to be careful these days of standing water and the prevention of disease from mosquitoes. Collecting run-off water aids us in a number of ways. It can be diverted away from the house, which can prevent water seepage into the basement. It can also be diverted to a specifically dry area that needs water the most. If harvesting-rainwater that is collected in huge amounts it can reduce the stress on water systems. When you also consider that so many people in the word struggle with water shortage every day for just the basic necessities of life, it seems such a shame to waste it. While North Americans can use upwards of 150 gallons of water per day, less fortunate people try to manage on 4 or 5 gallons, and that's on a good day. Now this might be the best reason of all to think about harvesting-rainwater that comes to us for nothing.